French President Emmanuel Macron and wife Brigitte had their first state dinner in the White House with US President Donald Trump and First Lady Melania Trump on Tuesday. The French President along with wife Brigitte arrived on Monday afternoon and then had an official welcome on Tuesday followed by state dinner. 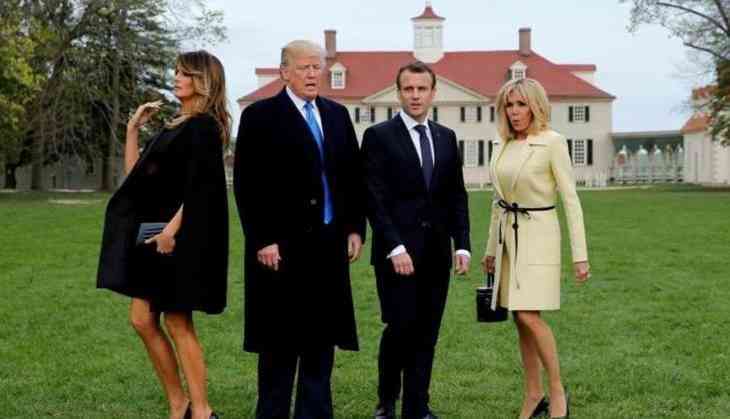 White house left no stone unturned for the Macrons visit. From gold-themed dinner to military band everything seemed perfect except for a few awkward moments for which Trump is very well known. Trump has a record of long-drawn handshakes and yesterday at the state dinner he did the same yet again. But, this time Twitter did not miss this uncomfortable handshake. Well, Trump and Macron uncomfortable moment did not last for a while it ended with a kiss. The first lady of US was caught on camera whisking her hand away from her husband Trump. This isn't the first time that the duo has been caught in such an awkward moment. Earlier in May 2017, she did the same when Trump tried to tuck her hair behind her ear. In February this year President Trump tried to hold Melania's hand but unfortunately could only get hold of her coat sleeve. This is the most awkward moment that was captured on camera. Trump tried flicking dandruff from Macron's suit collar. He even quoted, "We have a very special relationship, in fact, I'll get that little piece of dandruff off... We have to make him perfect, he is perfect."